Winner of the World Fantasy Award and the Shirley Jackson award. Also a finalist for the Nebula, Locus, and Sturgeon awards. A novella available in trade paperback and ebook from Tachyon Publications. Harrison is the Monster Detective, a storybook hero. Now he’s in his mid-thirties and spends most of his time not sleeping. Stan became a minor celebrity after being partially eaten by cannibals. Barbara is haunted by the messages carved upon her bones. Greta may or may not be a mass-murdering arsonist. And for some reason, Martin never takes off his high tech glasses. Unsurprisingly, no one believes their horrific tales, until they are sought out by psychotherapist Dr. Jan Sayer. What happens when these ostensibly-insane outcasts form a support group? Together they must discover which monsters they face are within and which are lurking in plain sight. Hi. This sounds like a very interesting book. I just finished reading “Second Person Present Tense” in 2005 Best SciFi and googled you. Thanks for writing! Sir thank you for this wonderful book! I just finished reading it and I must say its one of a kind. I do hope you’re considering to do a sequel! There’s just one thing that kept me thinking throughout and probably you’ve been asked this but…. Who is the narrator?! 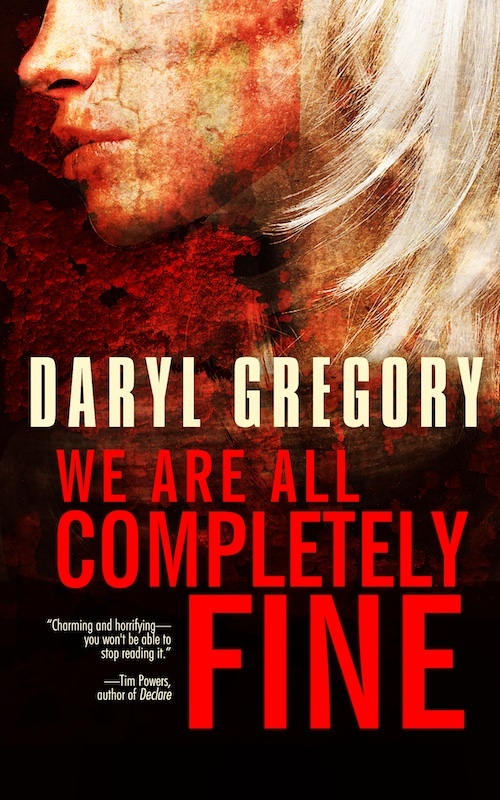 I just finished reading “We Are All Completely Fine” and it was a great experience ! You are now on top my Authors to follow list. I ordered “Raising Stony Mayhall” just after that. I can hardly wait for it. Do you know if your other books will be published in France ? I hope so because for the instant, there’s just two of them and it’s not enough. Keep doing the great job ! Sorry about the delay in responding. I have on my desk two new contracts for Belial in France– so look for the French versions of Afterparty and Harrison Squared sometime next year! Thanks for responding. It’s great news to know that two of yours books will be edited in France. I saw on the Belial Website that Afterparty will be available on August 2016. Thanks to this publisher, you can count me among your faithful (french) readers. My skin crawled around p. 36. I will never think about my bones the same way. Mission accomplished! Thanks for reading, Kevin.